Linlithgow Rose completed their preparations for the new season with a fine victory over Glenafton at Prestonfield on Saturday. The Scottish Junior Cup holders and West Super League champions travelled through from the West looking set to give Mark Bradley’s new-look side their toughest test to date. But following an encouraging display against St Mirren under-20s and a comfortable 3-1 victory away to Kilsyth Rangers, the signs continue to look promising for the Linlithgow side ahead of this Saturday’s Super League opener at Penicuik. Tommy Coyne hit a hat-trick in the win at Kilsyth and the Rose hitman - on his testimonial season - grabbed the limelight with another treble. It took the home side just three minutes to open the scoring. Aiden Malone was tripped in the box by Kyle McAusland - who had been trying to usher the ball out for a goal kick - and Coyne slotted home the penalty kick. Blair Batchelor and Roddy Maclennan then linked well but Maclennan’s shot was stopped by Glenafton keeper Brian McGarrity. The visitors then had chances to level through Jamie McKernon and David Gray. Midway through the first half Rose were into a change as they replaced defender Iain Gray with Jamie Mackenzie. 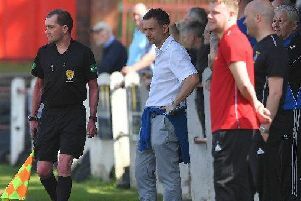 And they suffered another blow a few minutes later as Glenafton equalised, David Gray chipping the ball over Linlithgow keeper Darren Barnard after the Rose failed to clear their lines following a cross from the right. On balance, up to that point the Rose had been the better of the teams, but the visitors started to get on top around the half hour mark. And they made the most of that spell by taking the lead 10 minutes before half-time. Barnard looked to have Gray’s free-kick under control, but the Rose keeper somehow managed to let the ball slip past him into the net. However Rose hit back and were back on level terms just before half-time. Malone slipped a neat ball to Coyne and the Rose striker curled the ball past the keeper into the far corner for his second of the match. The Rose started the second half the same way as they had in the first - with an early goal from Coyne. Within a couple of minutes of the restart - after nice play from Malone and Roddy Maclennan - the Linlithgow midfielder did well to keep the ball in play at the byline and found Coyne who hit home for second hat-trick in successive games. However once more the lead was short-lived as the goal feast continued with a Glenafton equaliser. It came in the 53rd minute when Mackenzie misjudged Ally Park’s cross from the right, leaving Chris Dallas with a free header which he sent powerfully into the bottom corner of the net. Rose rang the changes in the 57th minute as Robert Sloan, Coyne - taking a well-earned breather - and Kyle Turnbull made way for Owen Ronald, Colin Strickland and Stewart Devine. Strickland almost made an immediate impact as he tested McGarrity with a powerful strike. Glenafton replaced Dallas with Dale Moore before Rose edged ahead once again in the 66th minute when Ronald found the net with a great angled shot after good work from Ruari Maclennan. The entertainment continued and with 15 minutes remaining Strickland had a great chance to score but he pulled his shot wide of the target. But a minute later Rose finally gave themselves breathing space as they stretched their advantage with a fifth goal. Colin Leiper’s through ball found Malone and the summer recruit slipped the ball past McGarrity into the net. Glenafton replaced Ryan Borris with Chris McKnight and the visitors might then have pulled a goal back, but Barnard did well with a one handed punch to concede a corner from Gray’s fierce free-kick. And it was Linlithgow who had the final say when, in closing seconds, Malone’s header was just over the bar. An entertaining match and a strong performance from the Rose means fans have a lot to be hopeful of in the season ahead.